is a native of New Delhi, India. Dr. Anand received her medical degree at Ramaiah Medical College. She then successfully completed Internships at Dr. Ram Manohar Lohia Hospital and Handa Medical Center and Diagnostic Laboratory in New Delhi. She then moved to Philadelphia, Pennsylvania in 2004 to attend an Observership Rotation in Pathology at Drexel University. While her husband completed his residency in gastroenterology, Dr. Anand worked towards her goal of being an outstanding dermatopathologist. She completed an internship in Internal Medicine at Albert Einstein Medical Center and a Pathology Residency at the University of Pennsylvania. She and her husband had two boys before she left Pennsylvania to attend a fellowship in dermatopathology at the University of Texas Southwestern. 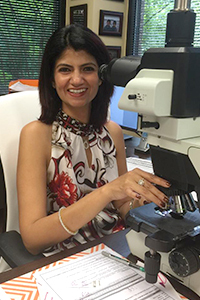 Dr. Anand is board certified in Pathology as well as Dermatopathology.She enjoys teaching dermatopathology to dermatologists, residents, and physician assistants. She is active in the education of residents at the Medical College of Georgia and Emory University Medical School.